The access door (rear door) can be opened using the inside handle. Pull (from the outside) or push (from the inside) the inside handle of the access door. 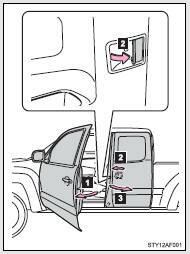 You can open and close the access door only when the front door is widely opened. The front door and access door could be damaged if they hit each other when being opened or closed.